Hey, DC! Earth Day Ice Cream Social At George’s! Brad will tell the story of the three-part mission of Ben & Jerry’s, and how it fits into the new movement for mission-driven business, at George Washington University’s Marvin Center on Earth Day, April 22, at 5:30 pm. 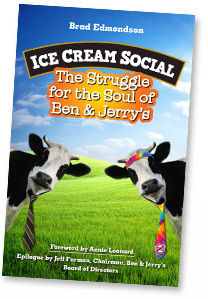 Ice Cream Social is the first book to tell the complete story of this iconic company, and it’s a page-turner: thousands of readers have stayed up way past their bedtimes. Admission is $5 and includes ice cream for the first 75 registered guests. So if you’re in the neighborhood on Earth Day, register for the event and we’ll see you there!